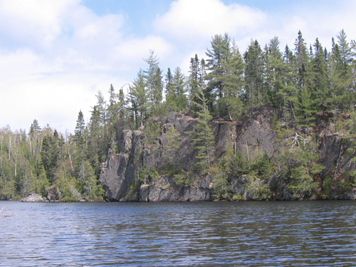 The Boundary Waters Canoe Area wilderness encompasses over one million pristine acres of lakes, rivers and forests in northeastern Minnesota. A paradise for the wilderness canoeist, the BWCA offers over 1,200 miles of canoe routes through some of the most beautiful country in the world. Within canoe country, you will find resident animals including timber wolves, black bear, bald eagles, osprey, great blue herons, loons, moose, otters and beaver. You will also find the best tasting fish. It’s a great way to relax and take a break from a stressful, busy life. A permit is required for entry into the BWCA; this is your ticket to enter a specific entry point on a specific day. It permits your group (maximum of 9 people and a maximum of 4 canoes) to occupy one designated campsite per permit. If you plan ahead, you should have no problem getting your preferred date. However, some entry points fill up during busy times of the season. To increase your chance for a permit, start your trip mid-week and avoid holidays. Need help picking an entry point? Let us know, we can help. You can request the permit to be sent to us for ease of pick-up. BWCA Permit reservations can be made online or by calling 1-877-444-6777 to check availability and to reserve your permit. In the BWCA you must camp only at established sites that are marked on BWCA maps. These sites have a fire grate and a latrine (a seat on a box without walls). We sell BWCA Fisher, McKenzie, and Voyager maps. The walk between lakes, measured in rods (1 rod is 16.5ft), is called the portage. 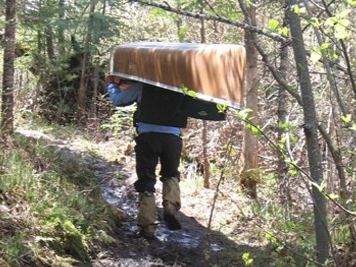 The goal is to “one trip portage.” In order to accomplish this, weight and volume should be kept to a minimum. One canoe pack per party member is a general rule. Portages can be very wet, rugged and rocky so waterproof hiking boots are the best footwear for travel. Northern, walleyes, small/large mouth bass, lake/brooke trout, and panfish are the varieties caught in the BWCA. Fishing is best early or later in the season. Fishing licenses and bait are available at the Holiday Gas Station just down the road from us. 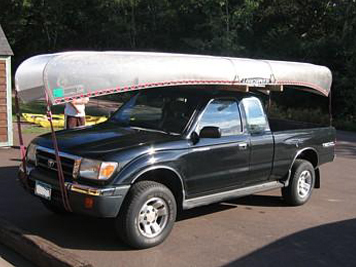 We have put from one to three canoes on all types of vehicles, except motorcycles. Foam blocks or roof racks are provided. If you have your own rack, we can extend it to haul two canoes. We can shuttle people to and from your entry point and give you the option of doing a point to point trip. Shuttle Service – Cost is $1.50/mile that we drive. The Timber-Frear Area is outside the BWCA. It’s nice and it is one of our best moose areas. It is about 20 miles from Tofte. Motors are permitted and no permit is required. Campsites have picnic tables, fire grates, and latrines. The loop is about seven hours in travel time through five or six lakes. A good destination area for three or four days. We like this area because no permit is needed. It’s safe and you are never more than four hours from your car. Groups of over 9 do not have to split up. Fishing is very good on most of the lakes. Always use caution and common sense when traveling in the wilderness, especially in cold water conditions. “Wet foot” loading, launching and landing works best for stability, is easier on your back and the canoe hull. Waterproof footwear is important in cold water conditions and we sell them in our store if you need them. When landing, don’t approach the shore at full speed. Place the paddle blade perpendicular to the hull and use as a brake to ease the canoe in. Make sure you secure your canoe well when on shore as the wind can pick up at any time. Swimming across a lake or hiking through thick brush for a canoe can be extremely difficult if not impossible. When looking for a tent site, try to pick one that will be safe from potential blow down (dead trees and branches) during a strong wind or thunderstorm. Don’t forget duct tape. Duct tape can be used for a variety of repairs on a wilderness canoe trip. Hull repair and paddle mending are two common uses. We’ve had customers use melted rubber worms to plug a hole in a canoe… I’ll bet they wished they had duct tape! 1- pair of shoes to get wet. Portages can be rocky, rugged, and muddy. Shoes should have good support. Flip flops are not a good idea. Temperatures could be anywhere from freezing to 90 degrees, even in August. Coming in May, June, Sept, or Oct?… You could see snow. Your clothing should be able to keep you warm in all temps. It is best to dress in layers and stay away from cotton. Synthetic or wool clothing offers good insulation and dries quickly. Lightweight long pants and long sleeve tops can also keep those pesky mosquitoes and flies off of you. Need help or suggestions, let us know. We are here to help.